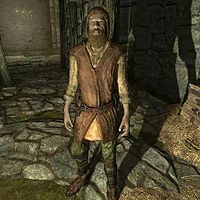 Christer is a Nord who is searching for his wife, Fjola. He believes her to be a hostage in the Mistwatch bandit stronghold, and offers a reward if she can be rescued. Christer wears a pair of boots, a set of clothes, and a hat. He carries no items. Christer will spend all of his time in a supply closet near the entrance to the Mistwatch North Tower. If you convince him to leave, he runs to the exit, never to be seen again after he leaves. After entering Mistwatch, Christer will call out to you by saying: "Hey, who's there?" After a moment, he will ask that you come speak to him: "You - over here, quick. Before any of them show up!" Continuing to stall will have him tell you that he needs assistance: "Please, stranger! I need your help!" Approaching Christer will have him ask for your assistance: "Stendarr's mercy - you aren't one of them. Please, you've got to help me!" When you ask him what's going on, he'll tell you: "It's my wife, Fjola! I think she's being held in this tower." After telling him to calm down and explain, he'll comply: "I'm sorry, I'm just... you're right. Let me explain. Fjola, my wife, left the farm on errands and never came back. It's been months, and I've been searching for her since. I heard a rumor that these bandits were ransoming captives, so I thought she may be here. I managed to sneak past the guards and get this far, but... I don't think I can go on. I'm no warrior! Please, can you look for her?" At this point you can ask him how he knows she is there or agree to search for her. Choosing the former option will have you ask if he's sure she's being held here. He will respond by revealing that he isn't sure of her whereabouts: "Honestly? I have no idea. But I've looked all over and the kidnappings here started around when she disappeared. So I have to hope..." Your only remaining option is to agree to search for her, requiring you to back out of the conversation entirely if you do not want to accept this quest. He will happily thank you for accepting his task, with a promise of gold if you find her. He will also give you Mistwatch Key so you can proceed further into the building: "Thank you! I don't have much, but I can give you some coin for the trouble. One of the guards dropped this key while I hid. I wager it will come in handy for you. Please hurry!" Speaking to Christer before discovering Fjola will have him claim that he does not wish to speak to you until Fjola is found: "Until you can find out whether Fjola is here there's nothing I care to to [sic] discuss." Returning to Christer after killing the Bandit Leader or agreeing to lie to Christer will have him question why Fjola isn't with you: "What news? Why isn't Fjola with you?" You will be given the options to tell him that Fjola is dead and you found her ring, that you did not find her but you found a wedding band, or that she attacked you and you were forced to kill her. If you tell him she's dead, but you found the ring, he will reply by thanking you for giving him closure: "That... I gave it to her on our wedding day. Help me, Divines... it's true isn't it? I'm sorry. Keep the ring. I cannot bear the weight of them in my heart, and I must make the journey alone now. Thank you for... thank you." If you just show him the ring but say there was no sign of her, he will thank you for helping him: "Her marriage band? Then there's hope - she was here! I have to move on if I want to find her. Please, take the coin I promised. Blessings of Stendarr on you!" Claiming that you killed her and that she attacked you will make Christer angered over your actions, causing him to blame you for this and attack you: "What? My Fjola would never... You monster! I'll kill you for this!" This page was last modified on 27 September 2018, at 09:01.